Join us for a Seychelles Island Cruise as we sail in paradise. 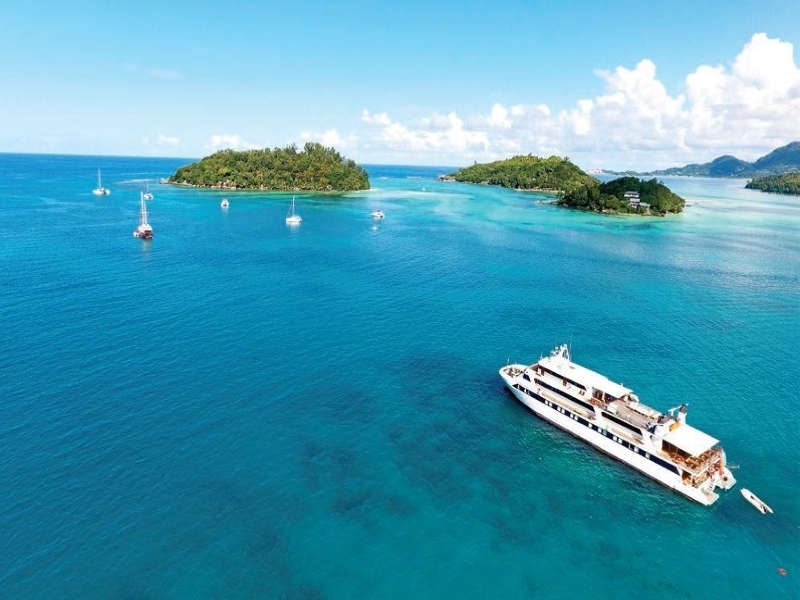 Discover white-sand beaches and uninhabited islands as you cruise through the shimmering waters of the Seychelles, travelling aboard beautifully appointed Pegasus. As she hops from island to island, choose to take a dip in a secluded cove, snorkel with turtles and a kaleidoscope of aquatic life, or relax in the golden sunshine while sipping a cocktail, all while enjoying her small-ship comforts. Fly overnight to the Seychelles, the archipelago of 115 pristine island idylls lying off the coast of Africa. Fly into main island Mahe, and upon arrival transfer to tiny capital Victoria, beautifully set against a backdrop of forested hills. Early this afternoon, board Pegasus, your welcoming, home-from-home for your island-hopping cruise. Settle into your cabin, meet your fellow passengers and, after a safety briefing from the Captain and crew, slip away from the Inter Island Quay for the short crossing to St Anne Island. Later, with the ship at anchor, enjoy a welcome cocktail and your first dinner aboard – perhaps choosing to dine alfresco. Awaken as Pegasus motors away from St Anne and heads across blue waters to the tiny ‘Ile Rouge’ (red isle) of Curieuse, uninhabited save for some 250 Giant Tortoises and extensive birdlife. In the company of the ship’s on-board naturalist, enjoy a guided walk along nature trails leading through the island’s mangrove forest. Return to the beach, to enjoy a barbecue prepared by the ship’s chefs, before spending a lazy afternoon dipping in and out of the sea or relaxing on the idyllic, white sand. Return to Pegasus for another balmy evening spent at anchor, perhaps enjoying dinner and a nightcap on board. This morning we’ll arrive at Cousin Island, where an included excursion introduces the protected Birdlife International reserve. Established in 1968, it is now a refuge for several endangered species and a breeding ground for Hawksbill turtles, which may be encountered on several of the island’s nesting beaches. Back aboard Pegasus, enjoy lunch before crowning the day with an afternoon at Praslin Island’s stunning Anse Lazio beach, a picture-perfect crescent of white sand fringed by clear blue waters. Spend time swimming, snorkelling or even diving (by arrangement at your own expense) in this holiday paradise, before enjoying another evening at anchor under the stars. Enjoy a lazy morning in Baie St Anne, or join the unforgettable optional excursion (bookable during your cruise) to UNESCO-listed Vallee de Mai nature reserve – for some, the original Garden of Eden. This is a paradise for bird-lovers, who might spot Blue Pigeon or Black Parrot amongst the lush forest – which is one of only two places where the famed Coco de Mer palm grows naturally. The excursion will also include the chance to swim at Cote d’Or beach, another world-class strand of fine, white sand. This afternoon, Pegasus slips away to another uninhabited idyll – either Felicite or Grand Soeur – for an afternoon of swimming, snorkelling or diving (payable locally), before arriving this evening off paradise isle La Digue, where you’ll anchor overnight. An optional excursion introduces the quaint island of La Digue, with its oxcarts, tiny villages, nature reserve, historic coconut and vanilla plantation at L’Union Estate, and the much-photographed granite outcrops of world-famous l’Anse Source d’Argent beach. After a chance to wander the shops of the main island village, La Passe, re-board the ship for a late afternoon’s cruise to Moyenne Island, opposite Mahe, and a last night at anchor. An included tour introduces Moyenne, a national park once owned in its entirety by a Yorkshireman, who introduced the island’s Giant Tortoises. Enjoy a last beach barbecue and a chance to swim or snorkel before making the short hop back to Port Victoria. Here you’ll enjoy the Captain’s Farewell Dinner, complete with live music and dancing on deck – a fitting way to end an unforgettable paradise island cruise. Bid Pegasus farewell, transfer to the airport and catch your return flight to the UK, ending a wonderful holiday.